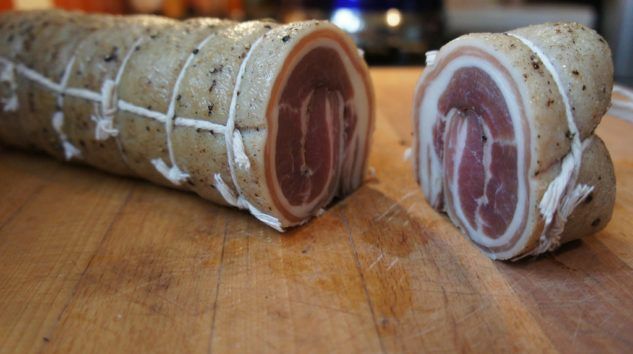 The word “pancetta” gets its name from the paunch of the pig (“pancia” in Italian), which is salted, spiced and dried for approximately three months, before being presented in a rolled form like a large sausage. Unlike bacon, it is almost never smoked. In Italy, about twenty varieties exist, and some of these even carry the Protected Designation of Origin (PDO). In Quebec, both the “sweet” and “spicy” varieties can be found in all the Italian grocery stores – of course – but they are now becoming more readily available in the corner supermarket. Pancetta is mostly used to flavour dishes, especially pasta sauces. “All’amatriciana” and “carbonara” pasta normally require pancetta, but our Quebec bacon will do just as well. I recommend to you here, pancetta in pasta with aubergines. When it is served on its own or as a garnishing on pizza, pancetta is presented in very thin slices. If it is wrapped well, it can be preserved for up to 3 weeks in the refrigerator and up to 6 weeks in the freezer. Originally published in the Journal de Montréal on November 15, 2008.